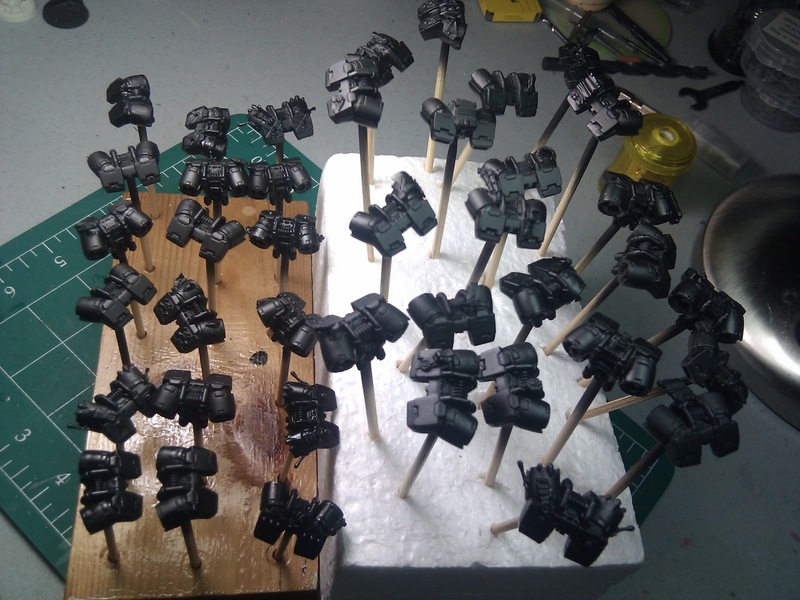 Boltguns, Bashers and Brushes: Thing a Day 1/26 Organization party! Organization party! So tonight I sat down to begin the next leg of my painting journey, my Jump Pack Marines. 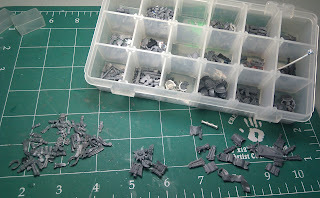 All told I have 4 units of 10 ASM to paint up, and since I use them on my Tuesday games, I will start by slapping together my Jump packs and getting them painted up first, then as I paint them 10 at a time, I can complete them with base and Jump pack for use in my games. So to setup 40 jump packs and get them ready to paint, it's time to clean and organize. Oh yeah, Martha Stewart, eat your heart out! First thing, I collected all of my jump packs. 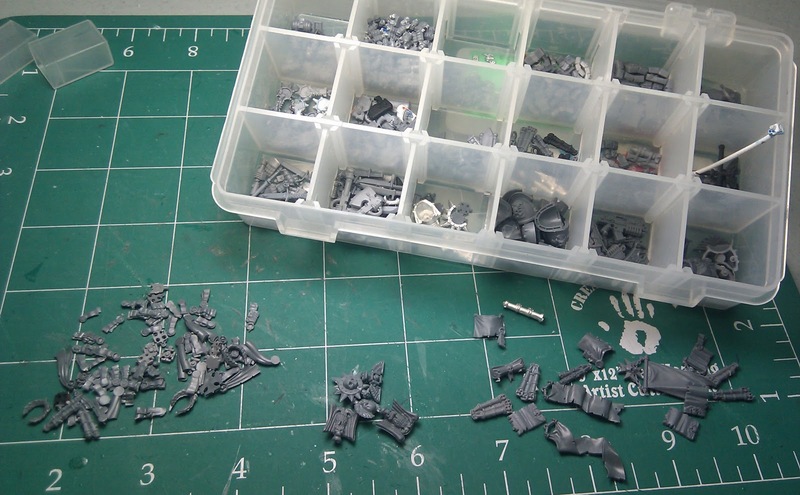 Including my ASM, VV, Characters, and Death Company I came up with a total of 85 jump packs. So yeaaahhh...lots of work to do. I decided to bling up my ASM packs and spread out a few of the DC fancy packs all across the army. 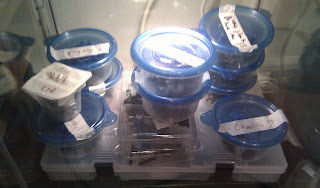 This time also afforded me a chance to split up and organize my units into little Tupperware containers with taped on labels. 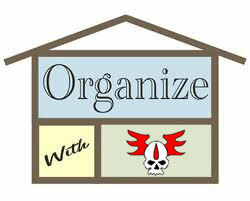 (I call everything that is a reclosable plastic container thing a Tupperware, even the large storage bins). This allowed me to separate my 40 ASM packs and get the rest back in my cabinet clean and organized. So with my 40 packs set out I decided to even out the bling from my bling pile. Scrolls, purity seals, banners, and all manner of icons were spread around at least one or two per pack to give them all a little Angels Sanguine artsy fartsy love. 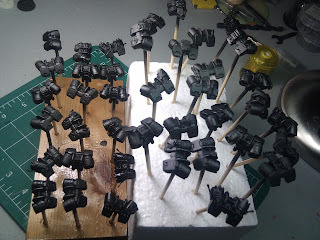 The next step was to get them ready for painting with a way to hold them. Instead of gluing a pin or a dowel into the pack, just putting a hole and jamming a pointy skewer did the trick. Drill a small hole inside the connection point, sharpen up a bamboo skewer section, and apply with acceptable force. Prime them up and we are good to go. Overall a evening of cleaning, organizing and model preparation, following a few days of assembly and gaming has given me a good painting break and got me fired up to work on my packs. 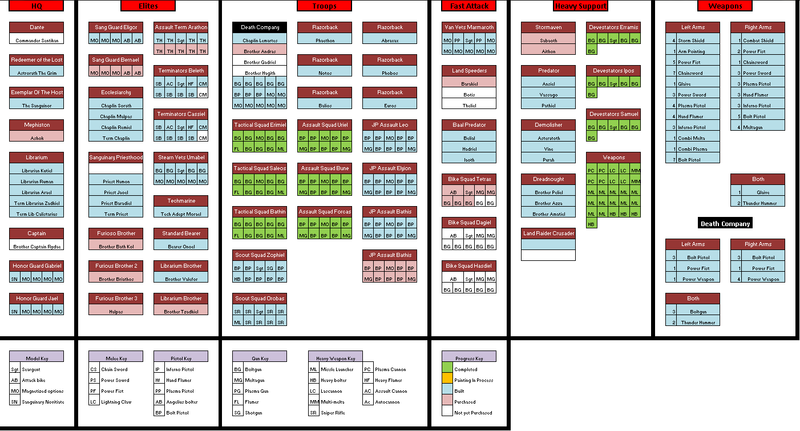 Here is my updated Army chart. I helped out the local FLGS and got some new models coming in within the next week. Stormraven and DC shenanagans coming your way soon. Click for a readable view. 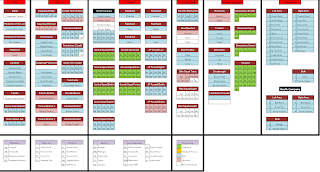 Here is my current Army Chart.